I am a night person but I also wake up very early every week day to attend to my chores and duties before I arrive at work. As such, I am totally drained out by mid of Thursday every week. BERTRAND RUSSELL, the British philosopher, was not a fan of work. In his 1932 essay, “In Praise of Idleness”, he reckoned that if society were better managed the average person would only need to work four hours a day. Such a small working day would “entitle a man to the necessities and elementary comforts of life.” The rest of the day could be devoted to the pursuit of science, painting and writing. Russell thought that technological advancement could free people from toil. John Maynard Keynes mooted a similar idea in a 1930 essay, "Economic possibilities for our grandchildren", in which he reckoned people might need work no more than 15 hours per week by 2030. But over 80 years after these speculations people seem to be working harder than ever. The Financial Times reports today that Workaholics Anonymous groups are taking off. Over the summer Bank of America faced intense criticism after a Stakhanovite intern died. Ah...a 4-day week, 15-hour week...sigh...how I wish. Interesting, they updated it with another article complete with reference to an actual research from Stanford: "Proof That You Should Get a Life". 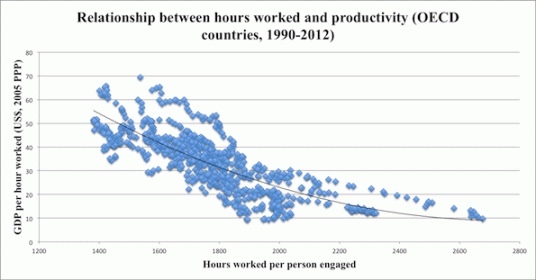 It basically concluded that the more you work the less productive you are. And here's another interesting article from HBR: "Manage Your Energy Not Your Time."